A reception to celebrate the 50th anniversary of the priestly ordination of Franciscan Father Leon Reuter will take place after the 5 p.m. Mass on June 16 and the 10 a.m. Mass on June 17 at St. Joseph Church, 125 E. Broadway, in Shelbyville. Father Leon, who grew up as a member of St. Joseph Parish, will be the principal celebrant for both Masses. 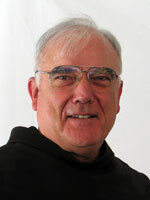 He is a member of the St. Louis-based Sacred Heart Province of the Franciscan Order of Friars Minor.